Combie Cottage is a four-bedroom cottage, situated beside a beautiful 450-acre lake in the Sierra Nevada foothills of northern California. The lake is surrounded by tall pines and majestic oaks. Rest and relax in a most peaceful setting, and let your cares melt away. Enjoy all manner of water sports ( power boating, water skiing, wake boarding, tubing, ), hiking, fishing, winter skiing, and nearby golfing. Feed the Canadian geese, or watch the deer. The home, recently remodeled in 2015, provides a fully self-contained vacation retreat that is perfect for couples, families, and small groups of friends. The cottage has a large front deck overlooking the lake with a large picnic table, charcoal barbecue, fire pit (great for marshmallow roasting! ), and comfortable deck furniture. There is also a wonderful swing located underneath the pines at water's edge. Guests may use free of charge the canoe, kayaks, paddle boat, and small fishing boat ( you bring the trolling motor) provided to explore Lake Combie, or they are welcome to bring their own watercraft between April and mid September since there is a launch ramp and floating dock on the property. Combie Cottage, although tucked away in the beautiful Bear River Wilderness Area, is not isolated and requires only a five minute drive to reach the Lake of the Pines Shopping Center which features restaurants, markets, specialty shops, and med clinic. There is even a nearby Starbucks! Also, only moments away, is the well regarded Dark Horse Public Golf Course. There is so much to enjoy while staying on Lake Combie and the charming home offers a wonderful sense of ambiance and tranquility during any season. The cottage is offered with a 2/3 nt. minimum from September through May and may be used on a weekly basis from June through August. Fully self contained and accessible! : Feel free to contact the owner who can answer any question. Highlights of Home, Property, and Area! : Combie Cottage has its own floating dock, boat launching ramp, sandy beach, canoe, kayaks, paddle boat, and small fishing boat! Hiking trails behind the house! Water skiing, wake boarding, tubing - there is even a slalom course on the lake! Bear River to explore as well as lake! Golf five minutes away at Dark Horse Golf Course! Nearby historic Gold Rush towns to visit! Skiing in Winter - Soda Springs, Donner, Boreal, Squaw Valley only 45/60 minutes away! 1700' scenic foothill elevation, just below snowline and above the valley fog! Lake does not freeze in winter and may be used all year long for recreational activities! Nearby white water rafting on upper, mid, and lower forks of the American River! Only an hour from Sacramento, 2 hours from the Bay Area, 1.2 hours from Reno, one hour from Lake Tahoe, and an hour and a half from Napa Valley! I love Nature and my favorite setting is spending time at my cottage on Lake Combie. I am also a traveler and am happiest when exploring other cultures and distant locations. I grew up in the South and my family had a 'Camp' on a recreational lake. My happiest memories were those at that lake when I was water skiing and swimming with family and friends. After moving to the West, it became my dream to find a 'California Camp' and give my own children a similar lakeside experience. I have owned this property for more than 30 years and it is still my fondest place to visit. Now I have grand children with whom to share this most special of lakeside retreats. I also hope that you can enjoy it, too! Nature! Nature! Nature! My favorite experience is awakening in the early morning and seeing mist rising from the lake. It is also wonderful fun to go exploring by boat and visit an area of marshland not far from the dam that reminds me of the southern lake that I so loved growing up in Louisiana. You don't need to own a boat to take a voyage of discovery, because you may enjoy my canoe, kayaks, or small fishing boat ( you bring the trolling motor) free of charge! I also have a great swing, located on a sandy beach close to the water, for enjoying lazy days or looking at the night stars; a floating dock which can be used for lounging or fishing; and a large outside deck which offers amazing water views of a jewel of a lake that most people do not even know about! If you have a boat, you may bring your own from mid April - mid September and can launch it from my own private ramp and then tie it up to the property's floating dock. There is even a slalom course on the lake for ski and wake board enthusiasts! Kayak or canoe to the Bear River and visit Upper Lake Combie, an area where few go, but is the home to much wildlife and water fowl. Combie Cottage sits beside one of only seven lakes which retain its water all summer long. It is truly a special place to visit! The Master bathroom was remodeled in 2015 and features a tub for those who enjoy the leisure of soaking in a hot tub. Bathroom 2, also fully remodeled in 2015, and located off the kitchen, provides a shower. The Combie Lake House is a waterfront property with its own floating boat dock, concrete launch ramp,& sandy beach.. Lake Combie is one of the few lakes that retains its water throughout the summer. Lake Combie is a lovely 450 Acre gem that is owned by Nevada Irrigation District and allows private water recreation for home owners and their guests. The Bear River provides water to Lake Combie. The Lake House offers lake views from almost all of its rooms. It has large picture windows throughout the house, which make the cottage feel almost like a boat floating on the water. The Lake House, is only steps from beautiful Lake Combie! In fact, the water is so close, that friends can easily talk to one another while standing on the front deck and floating boat dock. A house keeper cleans before and after each guests' visit and linens are provided. Please bring extra towels during the summer and for large groups. Parking is provided next to the cottage and in the large flat area above the home. The driveway has recently been widened and sealed. Please park only on my driveway or in the area above the home. On the outside deck is a portable fire pit perfect for burning wood and marshmallow roasting . The L.R. is based on a Great Room concept. It has a stone fire place as its focal point as well as a large flat screen television with DVD. There are two large hide a bed couches & comfy recliner. Large, new frig with bottom freezer purchased in 2015 Within the refrigerator is a fresh water tap. The Combie Cottage Kitchen was completely remodeled in June of 2015 with all new appliances, cabinets, quartz bar and counter tops, glass back splashes, wallpaper and flooring. The kitchen is fully self contained & has its own snack 2 seat table & 4 seat bar which opens to a dining room which seats six. There is outdoor dining just outside the dining room door seating 9/10. There are water " toys" for your enjoyment - a canoe, several kayaks, a small fishing ( you bring the trolling motor) and paddle boat . These boats are provided as a courtesy. The back yard is fenced. It hosts two picnic tables and boat house. The front deck overlooks Lake Combie and offers lovely views of the lake for those who may not have the ability to go out on the water. Home has both kayaks and a canoe for guest usage. Guests may also bring their own paddle boards, kayaks, and canoes. Home comes with a small fishing boat ( motor not included). Also has a concrete boat ramp so folks can bring their own boat or jet ski. There is also a floating dock. The large front deck which overlooks Lake Combie has built in seating, comfy lounge furniture, a portable fire pit, and picnic table. It has railings around it and two secure gates. One side of the back yard boat house can be used by lake house guests. It contains life jackets and paddles for the boats.Bring your own water toys. The Combie Lake House is located at 1700 feet. Although it is below the winter snow line most of the year, guests can go to the Lake Tahoe area for nearby skiing. The drive is 45 min - 1 hr away. Dark Horse Public Golf Course is only a couple of miles from the house. In fact it is an easy walk to go there for a bite of breakfast or lunch. Combie Cottage has a large front deck with built in seating as well deck furniture, picnic table, portable fire pit, & grill. The deck overlooks Lake Combie. In fact, the lake is so close that friends can easily converse with one another while standing on the floating dock and home's front deck. Besides the picnic table on the deck, there are two others, as well as a wonderful swing located on the sandy beach at water's edge. The property comes with its own boat ramp, so bring your watercraft or use the canoe, kayaks, paddle & fishing boat ( you bring your own trolling motor) provided at no extra charge! Combie Lake is a great place to explore as well as the Bear River which feeds it. 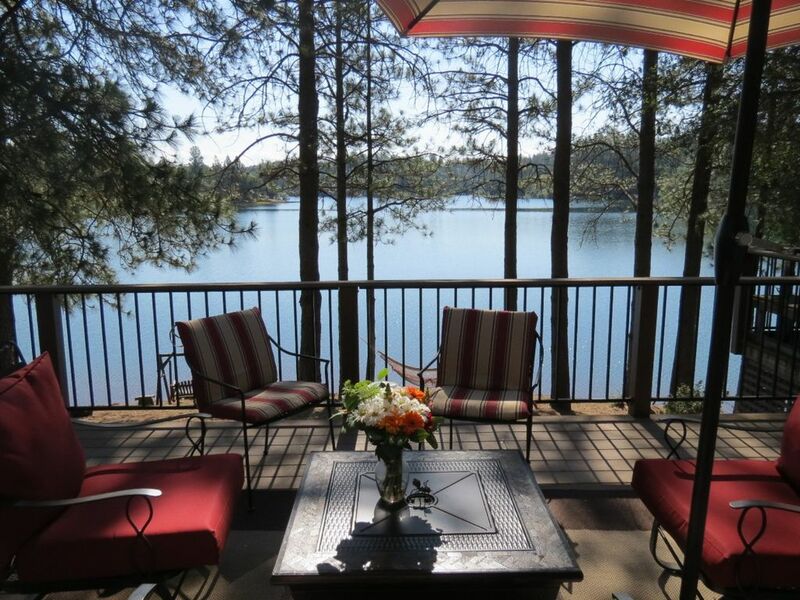 Relax on the deck underneath huge sun umbrellas while enjoying incredible lake views! Roast marshmallows in the fire pit & gaze at the stars from the floating dock or swing. Enjoy the sandy beach which has chairs & sun umbrellas, then cook steaks on the charcoal barbecue pit. This is the life! We had the pleasure of staying in this great home to celebrate an early Christmas with my family, who travelled from all over the country. It fit the 9 of us very comfortably! Plenty of seating in the living room, seating for 6 at the dining room table, with 3 barstools at the counter. Kitchen was fairly well stocked, but be prepared to bring all your own condiments, spices etc., which is no big deal. The back deck is huge, with beautiful views and access to the lake. It rained the whole time we were there, but I could easily see spending many days outside, and dining al fresco at the porch table. I knocked one star off this review for a few small reasons. One reason is the multiple power outages. The power outage is part of life and no one's fault, because of all the much needed rain. However, the problem is that there were only 2 candles in the whole entire house. No flashlights or other emergency candles etc., anywhere. That made for a VERY dark night, and a long walk in the dark to the bathroom on the other side of the house. The fireplace is for show, and does not put out any heat. Luckily, it wasn't a very cold night. What is not stated is that if the power does in fact go out, so does the water. We did not have running water for hours. I would recommend posting this somewhere in the house, and maybe having a few gallon jugs of emergency water stowed somewhere. All in all, our stay was wonderful, and we thoroughly enjoyed the time we spent together. Judith sent helpful instructions and accurate directions. She was very gracious and allowed us to check in early, in order to get the great grandparents sorted before it got dark. We would absolutely stay here again, and would highly recommend this place to everyone! Thank you for your hospitality! Thank you for visiting the cottage! Hope you will come back during the spring or summer season when the weather is warm and the lake is perfect for swimming and boating. Best! Great location on the lake - clean and basically perfect! This property was such a perfect location and so well sited so that the walk to the dock isn't difficult, there are toys in abundance and the layout of the house works well for vacationing with family. My only feedback is that the bed quality could be challenging for someone sensitive to sleeping issues, but all other elements of the house were fantastic. We all shared the one shower and that didn't seem to be a real issue since it is off the laundry area and not in anyone's private sleep area. Clean and nicely stocked so it was easy to make it "home" for the week. It's a "do again" in our book!! The lake is the best kept secret - so come enjoy but don't tell too many others! We have stayed at this lovely home many times over the last 20 Years. Every time we love it!! I am so glad you enjoy coming to Lake Combie and staying in my cottage. So sorry I could not schedule the new beach to be built before your arrival; but when you come next time, you will see a sandy beach by the water. It was just constructed a few days ago when the contractor could do it. Thanks again, Janice and family, for your continued patronage! It is really valued and appreciated. This was a perfect setting for our romantic honeymoon. We savored the quietness, drinking coffee on the deck, canoeing, and just being together on our first days as husband and wife. One of my favorite places on earth and feel fortunate to have gotten to enjoy the Potor Lake House. I wish we could have stayed longer but every detail was amazing and it was a special experience! Your honeymoon is one of the most special things you will remember as newlyweds. I am so glad to learn that your first days as newlyweds at the Potor Lake House - Combie Cottage was " love"ly. Congratulations on your marriage! We had a wonderful week with our teenagers on this peaceful wooded lake! The house is clean and updated with a generous deck overlooking the water. Nestled on the side of the lake for a perfect view, the house comes with its own dock and plenty of water sports for everyone. Even just enjoying a warm cup of coffee on a cool morning on the bench swing at the lake's edge is a great way to start the day while the kids sleep. Thank you for a lovely family vacation! I am glad that you had an enjoyable stay at Combie Cottage. Thank you for using my home. Combie Cottage is located at an elevation of 1700 feet on the banks of Combie Lake in the Sierra Nevada foothills. Surrounded by tall pines and oak trees, the cottage is a fifteen minute drive from the charming and historic former Gold Rush towns of Auburn and Grass Valley/Nevada City, and a one hour drive from Sacramento. Beautiful Lake Tahoe is also an one hour drive and the ski slopes of Soda Springs and Donner are only 45 minutes away! The Napa Valley Wine Country is 1 1/2 hours from the home while the San Francisco Bay area is a 2 hour drive. Although the home is located in the Bear Valley Wilderness area, it is not isolated. Restaurants, specialty shops, markets, and med clinic are within minutes from the cottage. Holiday weekends Thanksgiving, Easter, Memorial and Labor Day weekends - $25.00 more per night - some holiday periods may require a three night minimum The house keeper charges $100.00 for five houirs of cleaning. If families do not leave the cottage in good condition, there may be extra cleaning fees which will be taken out of the $350.00 security deposit. Guests are expected to empty the trash and put everything back as they found it upon arrival.